One key factor propelling demand in this sector is a 640 million strong regionwide consumer base with a growing middle-income segment. Rising incomes which shift consumption trends have also contributed to growth in this sector. Besides that, economies in the region have low operating costs which attract businesses from larger manufacturing bases. In recent times, China has seen rising wages and tighter regulations which have led to an increase in operating costs as it shifts towards higher value manufacturing. Hence, in order to replace the role that China once played, companies are looking to the ASEAN region for lower-value production networks which have also been largely integrated into global manufacturing value chains. ASEAN’s involvement in extra-regional trade deals has improved its standing as a global manufacturing hub. The ASEAN Economic Community (AEC) for example, envisions ASEAN as a single market and production base. Meanwhile, mega trade arrangements like the Regional Comprehensive Economic Partnership (RCEP) if successful would be a positive step towards a broader Free Trade Area of the Asia-Pacific (FTAAP) that can serve as a useful intergovernmental forum on free trade. Hence, manufacturers in the region would be able to enjoy lower transaction costs thanks to greater economic integration and a more coordinated and liberalised policy environment. With a global shift towards high tech, there has been a proliferation of opportunities in the automotive manufacturing industry. The automotive sector made up the fifth largest category of products being exported from the region with high export volumes of vehicles, parts, and accessories worth US$42.5 billion in 2016. According to a recent report, the industry, valued as a whole at US$62.5 billion in 2016 is expected to grow by 23 percent to US$77 billion in 2020. This would be spurred on by an uptick in domestic demand for passenger and commercial motor vehicles at 4.2 percent CAGR and 3.9 percent CAGR, respectively, between 2016 and 2022. Moreover, ASEAN member states already have an inherent strategic advantage as an automotive production and export hub catering to the wider Asia-Pacific region. With Thailand and Indonesia leading the way, the region is positioning itself as a cost-effective production hub for new energy vehicles powered by electric and hybrid systems. There is a pressing need for manufacturers to tap into secondary industries related to parts and accessories so as to establish a competitive advantage over other manufacturers. Growth opportunities also exist in the downstream production of refined fuels in ASEAN countries. A recent report suggested that this is driven by a widening gap between burgeoning consumption and limited local capacity. It has pointed to a serious need to boost domestic production in the coming years by opening new plants as well as upgrading existing ones to higher operating standards. Per capita energy demand in the region still lags behind the global average, signalling a significant avenue for growth. For ASEAN states to live up to their robust economic outlook they will have to meet domestic energy demands which could increase reliance on imported fuels and raise concerns over the economic burden of ensuring energy security. Therefore, national governments are looking to strengthen local refining industries, ease conditions for private sector investments, as well as create a balanced playing field for both, domestic and foreign players. The one possible chink in ASEAN’s manufacturing sector armour could be the bitter trade spat between the United States (US) and China as ASEAN remains very much at the heart of transnational value chains as exporters of manufactured intermediate goods, electronic products and solar panels which could be affected due to the latest spate of tariffs slapped on by the Trump administration. However, the effects of a trade war may be greatly exaggerated. There are other reports claiming that some ASEAN countries have instead benefitted from the trade war. Experts say that China will shift their production bases to ASEAN countries to evade the tariffs put in place by US President Donald Trump. 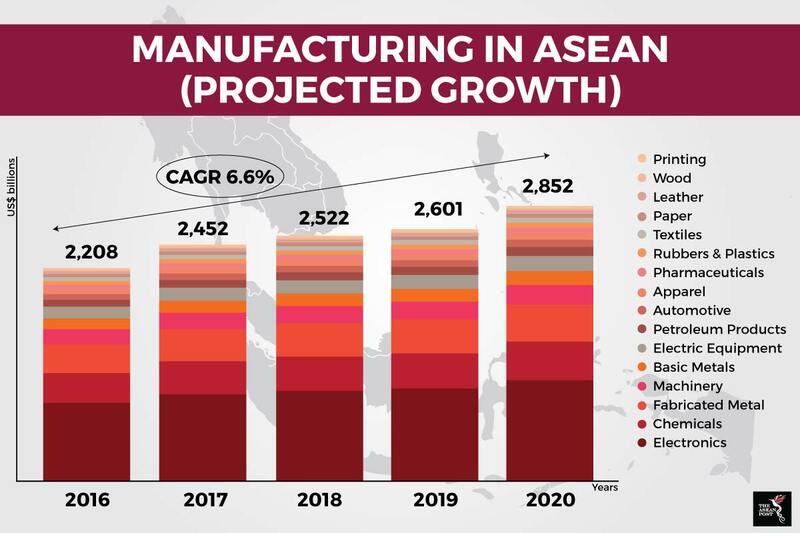 For now, manufacturing remains a vital sector for ASEAN’s economy. Though analysts are right to be wary of the trade war, prevailing and future market opportunities will contribute to the region’s growth into the distant future. Can Industry 4.0 change Southeast Asia's manufacturing?